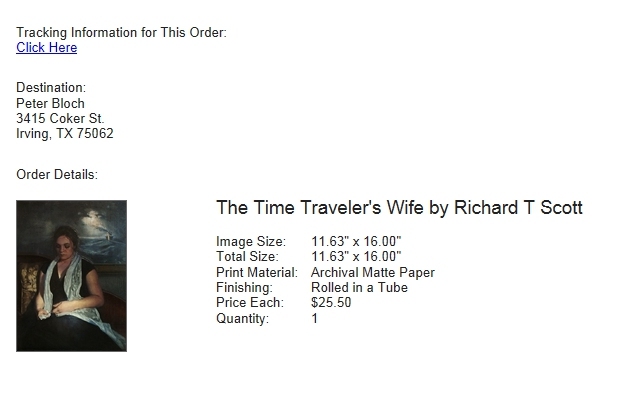 I recently aqcuired a print of Richard T. Scott’s “The Time Traveller’s Wife” from Fine Art America. Perhaps there is a small lack of beautiful things in my house; I want there to be more beautiful things around. If money can buy beautiful and uplifting things, why do we spend it on junk? Human nature…give me the shiney objects! I found a shiney object at Target the other day; it was on clearance because nobody wanted it. It was a metal nautilus shell. This is kindor what the metal Nautilus Shell that I bought looks like (minus the crazy stand). 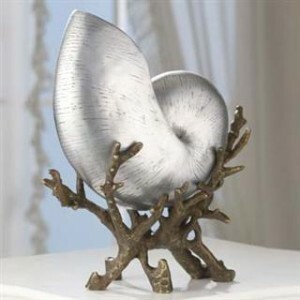 The Nautilus shell is a symbol of divinity and beauty. It’s structure employs a logorythmic spiral which has the golden ratio proportions. Although this particular metal Nautilus shell is pretty tacky looking, I was nevertheless excited to find a clearance item that all at once symbolizes profundity and implies mathematics, geometry, order, proportion, and logic. In some way, I felt that I had found a treasure, but it was only a treasure to me and the lucky few who had the gnostic knowledge to unlock the secrets of the Nautilus shell. Maybe I could take this neglected clearance item as a sign of some larger trend in culture? Is America getting to a point where its people can not recognize the significance of objects? Or is this shell just something so ugly and kitchy that only an artist and nerd could love it?